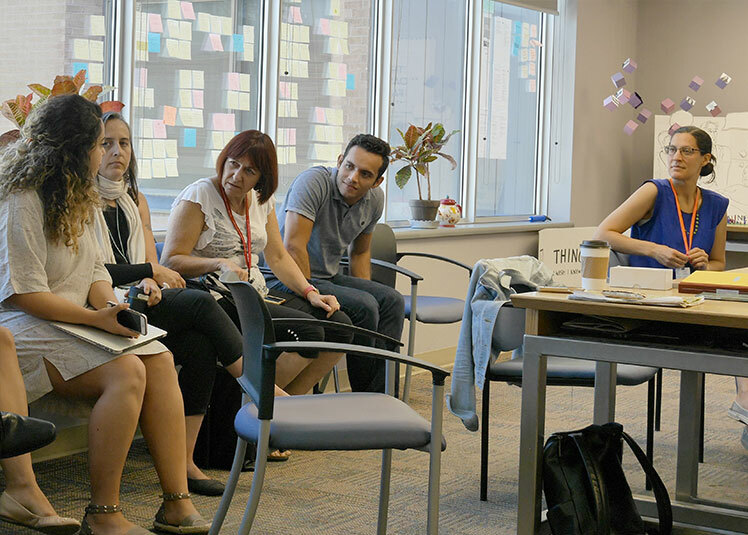 This month our team went on a ‘field trip’ to meet some of our neighbours at innovation hubs across Toronto, to learn about some of the fascinating work going on behind their doors. We came away excited and inspired, with more than a handful of takeaways for teams designing in healthcare. Our first stop was Synaptive Medical, a technology company focused on developing medical equipment and applications for neurosurgical procedures. The devices they demonstrated to us showcased advanced visualization tools and techniques for the operating room. the longer-term healthcare economic implications. With so many factors, the driver for change is often found in data: proving through numbers that disruptive technologies are worth all this effort. To an extent, the results of Synaptive’s work speak for themselves; benefits such as reduced space requirements and improved efficiency are clear. Other benefits are more of a shift, requiring individuals to build new habits or revise how they plan an approach. In these situations, seeing long-term data is key to finding motivation for pushing through and learning this new pattern. When an industry is relatively stable, like neurosurgery, and stakeholders aren’t necessarily even looking for change, finding the levers to inspire and encourage transformation are especially critical. Next up, we headed over to OpenLab, located within Toronto General Hospital as a part of the University Health Network. As a human-centered healthcare design hub, OpenLab’s solutions run the gamut from lo-fi paper-based resources for patients and healthcare professionals to a well-publicized initiative introducing VR to nursing homes. Managing that tension between designing for today and designing to nudge people into desired behaviours for tomorrow is a familiar challenge that OpenLab addresses through stakeholder engagement. A significant segment of OpenLab’s projects are community-based, where the strategy is to use a grassroots approach to build sustainable initiatives. One of their current initiatives, OasisTO, is an endeavor to replicate an earlier project in Kingston that established a self-managing seniors’ residence within an existing apartment building. The inspiration came from a group of seniors who were tired of feeling socially isolated, and the project blossomed into a strong, independent community. Part of the project’s success was thanks to a service design approach to collaboration and co-design: by letting the users set the goal, they’re more likely to move toward it. In this case, having a core group of seniors leading the charge motivated the future inhabitants more effectively than ‘outsiders’ (i.e. young people) trying to shape the direction of the home singlehandedly. But finding a voice can take time; it took three to four months for participants to feel comfortable articulating their interests. Which brings us to another facet of guiding change: building from the bottom-up can be a long-term commitment. Effective change often requires an implementation strategy to develop internal leaders who will follow through on setting in the new tools and resources. 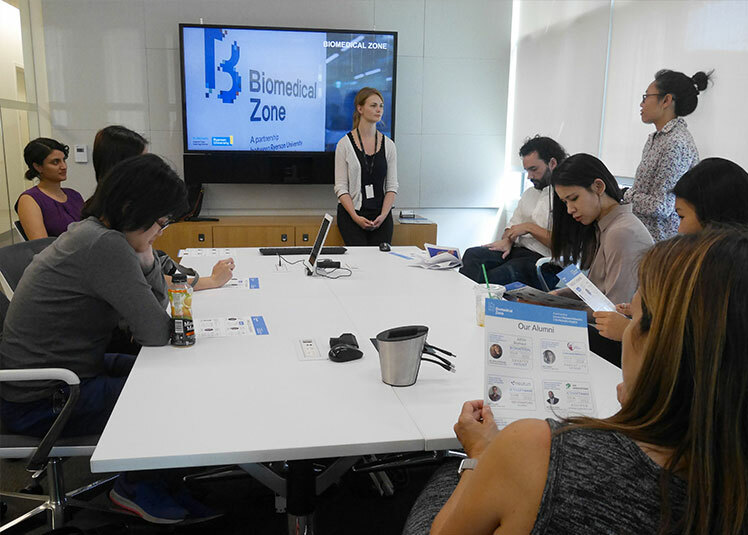 Moving further eastward, we paid a visit to the Bio-Medical Zone (BMZ), a start-up incubator for healthcare ventures supported by a collaboration between Ryerson University and St. Michael’s Hospital. This partnership connects BMZ entrepreneurs to a network of clinical and industry experts, as well as providing an invaluable environment for validating their products right on the hospital floor. Joining the BMZ as a prospective entrepreneur offers the advantage of coaching to keep you on track, as well as the opportunity to be part of a collaborative space where budding businesses can engage and learn from each other. In fact, the BMZ assesses entrepreneurs on how well they might contribute to the ecosystem; at only 2000 sq ft, any new additions to the community have a big impact. Hearing about the diversity of companies harboured by the hub brought to mind the appreciation that if every company represents a response to one need, just think what opportunities might arise when seemingly disassociated needs combine. Bringing together different perspectives that might normally focus on one problem pushes the door open for more holistic solutions. Of course, a great idea is only half the battle: it’s all about execution. Even once an idea has traction with its users, start-ups can still need help validating and refining the business model of their concept in the broader healthcare landscape. One of the greatest barriers for a lot of start-ups is being able to make the leap into logistical and administrative hospital systems. For example, latching onto hospital budgets and knowing how to conduct research to show cost and outcomes is crucial (not coincidentally echoing some of the key lessons from that morning). That’s where the savvy of industry experts really delivers. We closed off the day with one more stop: squid dissection and ink painting at Action Potential Lab! A playful science and arts hub for kids and adults alike, admittedly, this one was more for us to roll up our sleeves and try our hand at something new. Still, in the vein of inspiration, experimentation goes a long way to making a big impact (and not just because squid smell is not easily forgotten). Scalpels in hand, our troop can confirm that the best way to learn is often to dive right in. And really, that leads to the final takeaway of the day: just get out there and be curious! 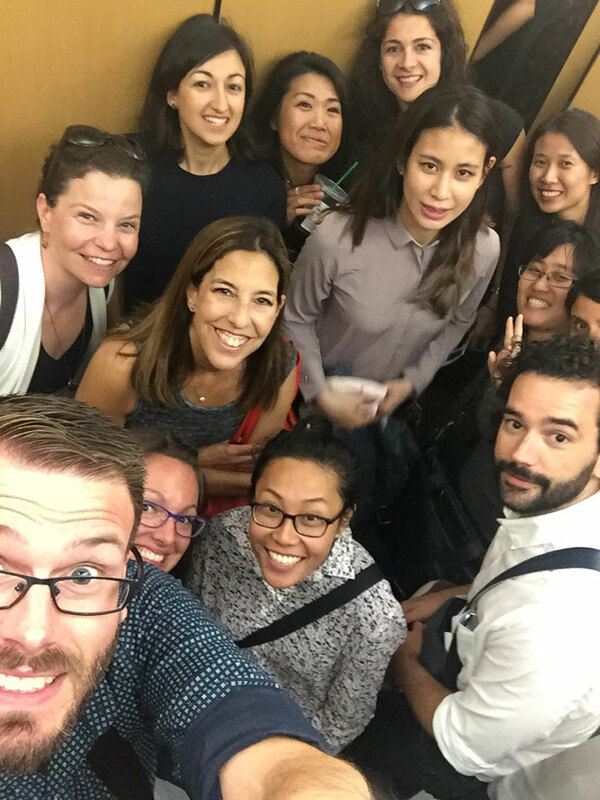 How many Bridgers can you fit in an elevator?